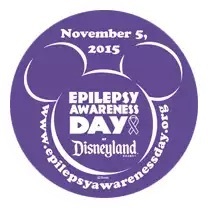 Epilepsy Awareness Day at Disneyland! I'm writing this from the airport on our way to Epilepsy Awareness day at Disneyland. We'll have a table there demonstrating SAMi and meeting lots of great people. In celebration we have a $20 off coupon, just enter "EAD15" when checking out. Good for SAMi cameras and kits!